Jenna + Amir’s Cultural Center Wedding Photos! Amir + Jenna planned the most amazing wedding! It started at Chicago’s finest luxury hotel, The Langham Chicago and ended a few blocks away at the Chicago Cultural Center! The Langham Hotel is housed in a classic Mies van der Rohe building and the Cultural Center was designed in a neoclassical style over 100yrs ago! One of my favorite photos from their day was during their ‘first look’ – Jenna’s face holds so much emotion and Amir was moved to tears when he saw her. These are the moments that make my job as a wedding photographer so special! Be sure to scroll through all 60+ images on this wedding blog post! Amir has been following my wedding photography business for a long time. He has seen me first hand at a couple weddings and was in the bridal party for his sister’s wedding! Shout out to Chrissy from Big City Bride for helping plan and coordinate everything! Love this first photo of the two of them. 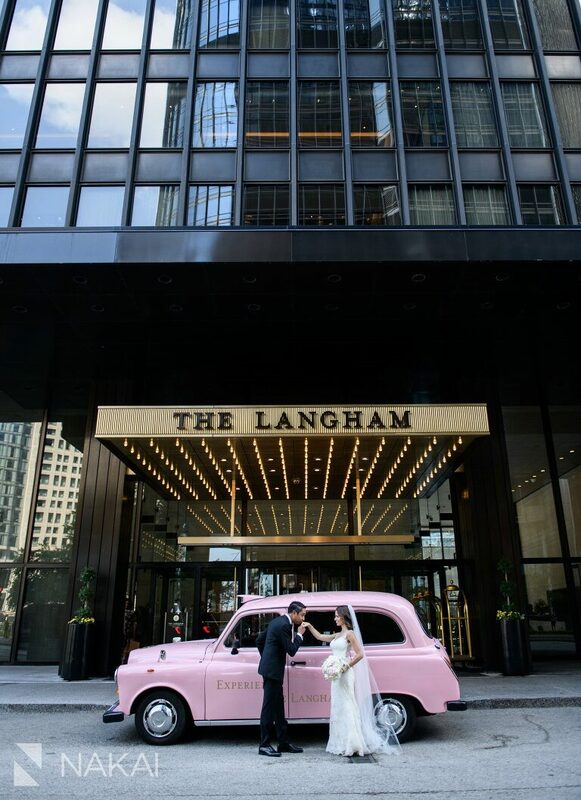 The soft moment of a kiss juxtaposed by the strong lines of the Langham Chicago! A photo of them on the Chicago Cultural Center staircase! Photographer’s Tip: When the architecture is so unique – be sure to showcase it! 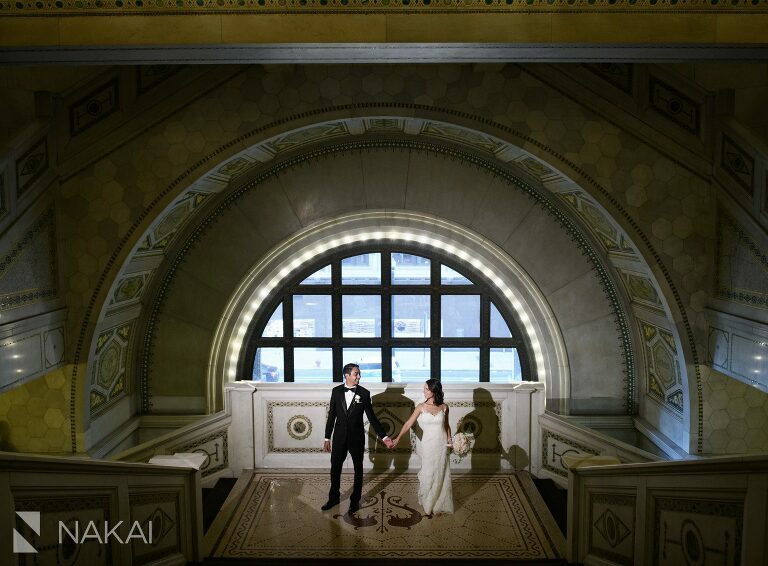 The Chicago Cultural Center is a beautiful venue for a wedding ceremony! The Tiffany Dome has no equal in Chicago! Their luxury details pair perfectly with the space! Yanni Design Studio did a fantastic job transforming the room for their wedding reception! If you haven’t already seen them, check out Amir + Jenna’s Chicago engagement photos! The Langham Chicago is located right along the Chicago River, as showcased in this picture! Love the details in her dress and veil! One of the most special moments on her wedding day! That special moment when you see each other for the first time on your wedding day! We had to include Bailey into their wedding photos! We stepped outside for a few photos! Amir asked me to re-create a photo I had taken at a previous wedding he attended – 8yrs ago! Shout out to Roseanne and Josh! I photographed their wedding seven years ago – and now they have two kids! Thank you Amir + Jenna for having me as your wedding photographer! We captured so many epic photos on your day! I can’t wait to share the full set with you! « Val + Kenny’s Langham Chicago Wedding Photography Slideshow!